$435.00 In stock. Order in the next 18 hours and it will go out today! 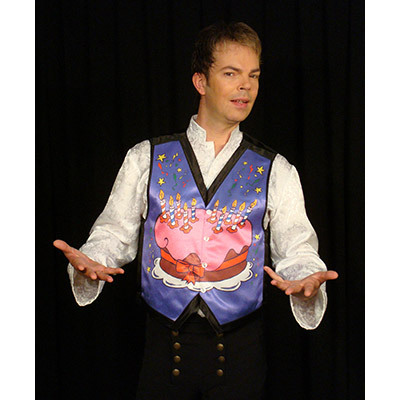 A plain white vest buttoned at the front and showing out from underneath an ope jacket (the vest may also be worn and performed without a jacket) becomes emblazened with a beautifully illustrated brithday (or celebration) cake. After more byplay (many ideas given) the cake on the vest becomes colored in an array of bright colors - the vest itself is now a multi-colored display - time celebrate! Furthermore the candles upon the cake light up, and after everyone in the audience has sung "Happy Birthday" the birthday person can blow out the candles on the cake!